Also I consider HE to be one of the few races, that can actually make a competitive balanced list. My WE experience supports this. The lack of a stand up and fight unit makes archers/fast cav just the best. Guys like Thomas Munk and Tom Robinson have had some joy with EG-stars plus support but how balanced that is and how effective all-comers in the final analysis, are open questions. I too query the lack of Book here Seredain. Was it just to save 10pts? So, inevitably, with the site broken (what happened there? ), I bugger off for a few months and then look what happens! 8th finishes and we have a whole new game come through the door. So I thought I’d sign off on the old list and welcome in my first draft for Age of Sigmar. I can only apologise to those helpful souls above for failing to get back to them – this is the first time I’ve logged on since my last post. Chiefly this was due, first, to Ulthuan going down, but also an enormous disinclination to sit in front of a computer screen having spent all day, every day, sitting in front of a computer screen at work. Happily, I am currently enjoying a lovely holiday in Majorca and so am far less inclined to pick up my laptop and smash it against a wall before reading a book - or anything not on a screen (don't you find it makes your eyes go funny, after a while?). In fact, I've had an itch to finish the 8th Edition story of the army, and the poolside is as good a place to sit and type as any. 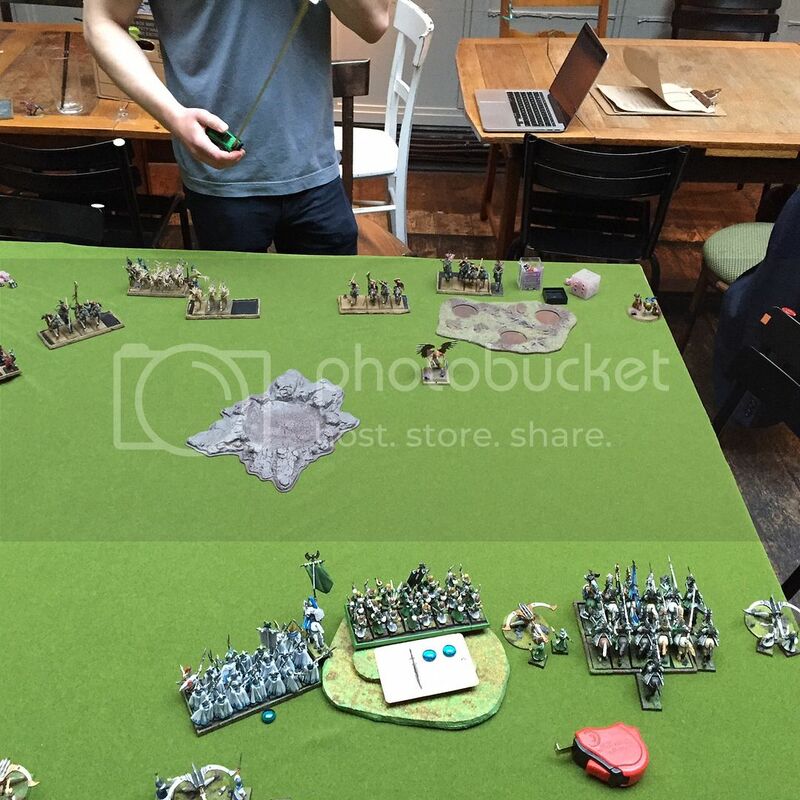 My penultimate game was against white lion star elves with multi light-casters plus anti-heroes loremaster, a frost phoenix and MSU cavalry with a couple of bolt throwers. Things started cageily, albeit my long range shooting pinged off his bolters quickly (partly thanks to a 36” fireball from the loremaster), and his frosty failed a charge into one of my own machines. My firebase was protected by the phoenix guard, who I knew could take a weakened lion unit, and the centre ground was held by my helms plus BSB. As his MSU units started to be whittled down, things looked under control, but then a failed panic test by the helms, on re-rolled 10 no less, saw them run off the board and totally abdicate control of the centre of the field - then I was in trouble. Somehow, through judicious use of my ranged attacks and a tight deployment to discourage the frosty from running amok, I clawed points back, in particular by throwing my prince and loremaster out of their units to carve up MSU silver helms on the right whilst the frosty was stuck on my left. These heroes then ran into the white lions to start assassinating characters – that unit being much reduced by bolter fire. Unfortunately, one disastrous round of combat saw my loremaster killed by 5 lion attacks and my prince wounded twice by the enemy loremaster, whilst a reaver charge in the rear went disastrously wrong and saw me lose, not gain, combat res. Simultaneously, the phoenix guard had failed a soft charge to clean up the lions and secure victory. This was too much for one round of combat. My prince fled, but escaped, and I went down by something like 11 to 9. A good plan gone wrong, and a fun game. Catching frosties is difficult for my army (sorry, was difficult), but once again a flyer had been forced by tight deployment to stay out of the action for fear of getting pinned and swamped, so it was at this moment that I decided the featherfoe torc on my 2.5 list was not really necessary. By contrast, I'd been impressed by the Sword of Anti-heroes on my opponent’s loremaster, so quickly resolved a new build for my 2.5 BSB. Apart from that I learned little - subject to a rather large bum-fudge from Mistress Fortune, I think I have the measure of white lion-based high elf armies. Phoenix guard, ranged spam, archers and fast combat characters do well against them – they suffer hugely from slow movement and a lack of ASF once the ranged war is lost. My last game was against a light-based Empire list with stank, two cannons, double demis, big block of halbs, skirmishing archers, wizards, warrior priest, walter – the usual. As a match-up, this is one of the harder ones. I say this with no hint of whinging – I can take these lists – but conditions need to be right for me to pull off big wins. Specifically, I need to do real damage at range in order to neutralise the steam tank as a serious threat – otherwise he can pin one of my two main units, especially the phoenix guard, down – and its these who I really want pushing into the halbs whilst my magic, machines and knights run down the demis. Similarly, in my favour, Empire finds it very difficult to take big points off me unless I run straight into the jaws of the trap to find myself getting pummelled by banishments and cannonballs, then pinned by the stank and overwhelmed by a halb-demi counter-charge (I learned that lesson the hard way from my first game against this kind of list, and I wasn’t about to repeat it the mistake). If I don’t run immediately into 24” range of the walter, however, the Empire bubble can’t do its work – and these sorts of lists are in my experience, reluctant to go on the offensive. And so it proved this game. I needed to plink off the cannons with arrows and put wounds on the steam tank with bolts and searing doom, and my opponent needed to wallop me with his war machines and magic before deciding whether to commit with his demigryphs. Without inflicting damage at range, I would not commit to the attack, and neither would he. But, in the event, both our shooting and magic phases were duds – throughout the game. He took some bolt throwers and the reavers, I took a cannon with archers and a unit of demis with the character-led helms (Hand of Glory for M10 and +2 WS being most welcome). His army looked worse than mine, by the end of it, but there is very little to say to say about this game other than it was a stand-off. I mullered the halbs, but they simply hid behind a house (buildings make Empire turtles so much harder to crack). His stank, having lost no wounds to dud searing dooms and bolts, pinned my phoenix guard, and both units stayed there (the loremaster’s ogre blade not doing its duty this time), chatting or something. Draw. So what became of the 8th Cav Prince list? Albeit it had only been 2200 points, I learned a lot from Firestorm 4s, finally, about the usefulness of the sword of anti-heroes. By this point, the phoenix guard block had become the solid heart of the army and, with the sword-toting BSB (a decent option event against cannons, since he could bounce two balls), liberated the helms and prince from anti-deathstar duty to use their speed in more imaginative and useful ways. If anything could crack the no-sword 3++ guard, it was a genuine multi-character deathstar. For those moments when I wanted to go full bus with the helms, massed characters were, again, the biggest threat. And after several games against lists with one or multiple flying monsters, I found that I’d had fewer problems than I’d feared. The fact was that even the archers, being deployed in numbers, would hold on steadfast for long enough for me to bring in support against flyers which lacked steadfast-breaking numbers of attacks. Having a unit of real size was very important to their role not only as ranged offense, but as ranked-up infantry. Indeed, ranged dominance combined with ranked-up defence and quickly organised counter-attacks had seen me secure an extremely high success rate (total, after that last high elf game) against lists with flying monsters/characters. Deathstar lists, particularly ogres (helms being quite poor against ironguts and ironblasters), struck me as more of a problem. Another potential problem was death magic, since I had relatively few true wards on my characters. Magic-heavy ranged lists also posed a constant threat to the helms-as-bodyguard so, although less potent, swapping the power stone on the archmage to a scroll of shielding felt like a safer all-comers choice. Finally, I wanted the Reaver Bow back. I long ago decided that the Bow + Potion cavalry noble was too fiddly to use, left the noble too unprotected and offered no support to the prince. However, the bow itself remained excellent value for the points, added extra dominance in shooting wars and still allowed room for a lance, enchanted shield, luckstone and OTS for combat duties and prince support. Depending on the opposition, the noble could either act as a front-line companion to the prince, with the bow as a useful bonus for early turns stand-offs or even stand-and-shoot duties against other cavalry, or else he could act as the new quarterback character (see page 56), whilst the BSB was engaged in serious combat and leadership duties with my frontline units. Prince - Dragon Armour, Shield, Barded Elven Steed, Giant Blade, Dragon Helm, Dawnstone, Ironcurse Icon. Archmage - Level 4, High Magic, Talisman of Preservation, Scroll of Shielding, Ring of Khaine's Fury. Loremaster - Ogre Blade, Merwyrm Shield, Dispel Scroll. Battle Standard Bearer - Dragon Armour, Barded Elven Steed, Sword of Anti-Heroes, Charmed Shield, Golden Crown, Potion of Foolhardiness. Noble – Lance, Dragon Armour, Barded Elven Steed, Reaver Bow, Enchanted Shield, Luckstone, Other Trickster’s Shard. 11 Silver Helms - High Helm, Musician, Standard Bearer, Shields. 24 Archers - Hawkeye, Musician, Standard Bearer. 19 Phoenix Guard - Keeper, Musician, Standard Bearer, Razor Standard. I should say, in enormously late reply to SpellArcher and Andros, that the lack of Book of Hoeth was simply down to the fact that I wanted to spam magic missiles with the Ring of Fury. This was one of the best ways to spend a (risk free) single dice and, along with the loremaster's spell variety and the archmage's access to basic Soul Quench, gave me a huge amount of damage output in the magic phase. Compare the cost of casting a large soul quench with the cost of spamming two small ones - the latter can be done much more cheaply - although I always had the option to throw 6d6 hits when I wished. It also allowed me to choose other spells for the archmge, where occasion dictated, without losing altogether this ability to throw hits with him. All together, this was much more important to me than the extra casting power of the Book. Partly because my army's existence depended on its ability to control the movement phase and win shooting wars against massed-missile armies, especially skirmishers who could avoid combat with the phoenix guard - making the annihilation of light troops absolutely essential for the list's all-comers credentials. Further, I'd taken the loremaster, which might mean only casting 1-2 spells per turn with the archmage. That would, of course, mean I got much less benefit from the Book's re-roll. As for the Book in defence, where it is most valuable (since the archmage would always be the dispeller of choice), the Scroll of Shielding could effectively eat more dice in a round (much as a dispel scroll would), than the Book would manage on a crucial turn. Not as potent over time, but a decent prop given the extra damage output and tactical options given me by the Ring. And, d’you know what? It all worked. Alas, for lack of time to write, I took no pictures and produced no reports. But finally I’d found a list I was totally happy with. And it showed – even ogres were somehow, finally, much less of a threat as, with another top-notch combat character in the form of the BSB and that extra pip of shooting, I could control the match ups much more easily. The prince was liberated to pursue specialist targets with his knights (mournfang etc), whilst the anti-heroes BSB finally allowed me to march full-face toward the ironguts with the phoenix guard, giving me much better cover for my archers and machines and allowing me to bring the ironblasters into range of my arrows and (particularly) magic – something I’d traditionally struggled to do whilst standing off against ogre gutstars in the past (although shifting casters back into the archers was usually a good idea when the hellheart was there). Finally, 9th loomed, and I thought I’d best take some shots of what looked like my last game. Appropriately, it was against dark elves. 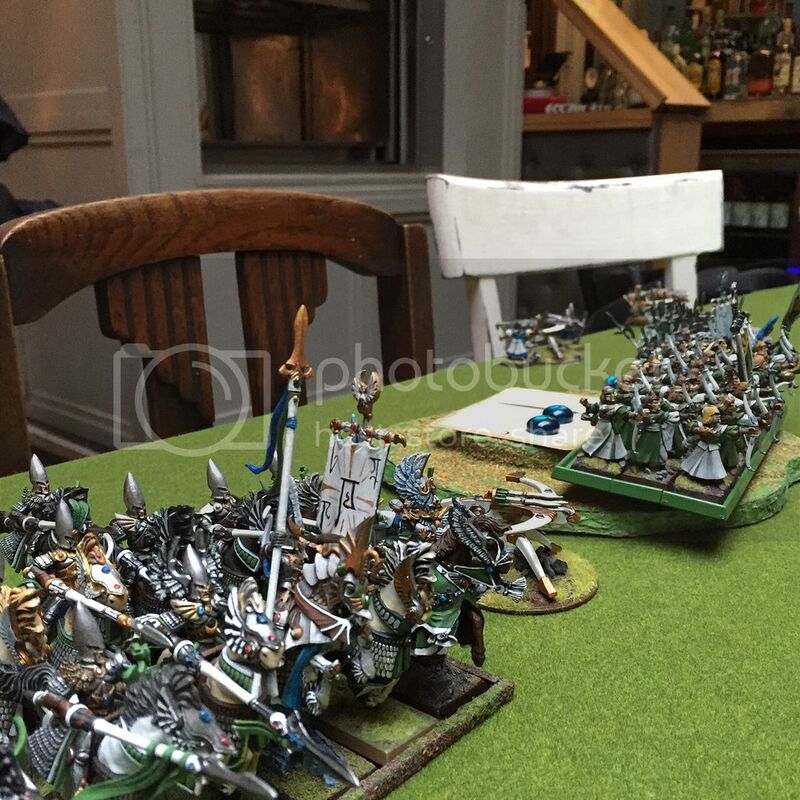 A huge unit of shades with Hellebron, and a bunch of MSU units including dark riders, warlocks, flying BSB etc. I castled, drew the enemy into a hasty advance with my advantage at 30+ inches, and then opened up with massed magic missiles. Arcane unforging saw me pick off the BSB, and massed bolts and arrows withered the (very dangerous) shade star. It wasn’t an especially close game, but my tight deployment did at least allow for a final few decent photographs of the 8th Edition cavalry prince and his army. Well, first off, I’m annoyed that only dragonlords get access to a uniquely good sword. There, I've got that off my chest. But aside from that, we have good news. I’m very grateful that the leadership abilities of princes make them excellent choices for combined arms lists – re-rolled hits and the phoenix helm (sorry, standard), are both excellent. Enchanted shield combines extremely well with Crystal Shield to create a rock-solid model, and our new loremasters’ hand of glory makes the Enchanted Polearm an excellent weapon for combat (though, in the early turns, you’ll be wanting to use this on your bolt throwers). More importantly, taking smaller characters like this provides you with excellent synergies compared with what our monster choices can manage. But, before we get to such questions, we need to pick a points/comp system. Presumably because GW intend to release a totally new pan-elf army book in due course, they’ve given us rules and no points costs. I expect (hope?) that, in line with 40K, points will return with the new army books. Without any such grading, army selection remains a total can of worms for us players who want to make sure that the army opposite is of roughly equal strength to ours. Luckily the Scene has responded quickly and, at this stage, the most influential comp (in the UK at least) is Mo’s Indy Comp, which uses a simple Pool Choice system to roughly grade unit choices and, also, impose a cap of 40 shots per army (based on a model’s basic shots, excluding special abilities, with bolt throwers counting as 3 each). Under the comp, you pick a force of 20 pool choices and deploy them however you like down to a minimum number of troops per drop – typically 10 for infantry, 5 for cavalry and 3 for monstrous cavalry. Each scroll choice buys you 3/5/10 models for X pool choices. When it comes to characters, ridden monsters are expensive (4.5 for a dragonlord), and non-monstrous characters are cheap (Princes, loremasters, seahelms and mages are 1 pool choice each). So, although your prince can no longer rely on a Look Out Sir save to stop war machines from blowing him away (alas, only Annointeds have access to the old ward saves), you can at least take comfort from the fact that he cost you less than 10 archers (1.5 pool choices), and that he can use his new abilities to impact the game whilst staying at a safe distance. Similarly, although massed archer fire is much more dangerous to a 4+rr prince than the old 1+rr build, aside from armour buffs you can, at least, stay out of range of shots much more easily now that the common-garden longbow only has a range of 20”. Your own archers can, meanwhile, march into the jaws of death with much more impunity now that you can shield them with another unit to the front without having to worry about tricky 8th Ed line of sight issues. It’s a brave new world and, for all the complaints we will no doubt see about ‘dumbing down’, the new game does at least give you complete freedom to create your own army formations and use them much more intuitively than was possible before. 2 Bolt Throwers – 5 PC (yes, they’re insanely expensive under current comp – a Slann being 4.5 and a Hellcannon 5 PCs – I can only dream they get cheaper). Many of you will already have spotted that bonuses offered by spells and characters, at least for our army, make no distinction between shooting and close combat attacks. You will also have noticed that missile units can shoot, on their turn, even if engaged in combat. On the other hand, the movement advantage of cavalry over infantry is now much more distinct and, with the potential that you and your opponent can get two turns in a row, real combat troops remain important to shield your ranged power and to take and hold objectives (the shot cap, in any case, forces you to take something other than full bowlines). With that in mind, I have here a three-layer army which can either play to win the shooting war with massed shots (archers can double fire once, reavers usually get 3 shots per model, characters offer decent buffs), combined with a cavalry assault on enemy war machines; or else tackle a combat-heavy army by pinning select units with cavalry and infantry whilst firing magic and missiles over the top (and indeed into combat). Such is the freedom to target anything within range in Age of Sigmar, that combining your arms into one combat is now more possible, and beneficial, than ever. The characters, meanwhile, are simple to use. The prince provides leadership re-rolls and Hit re-rolls, before engaging an existing combat in a flank, where he’ll face fewer attacks (more on this to come). 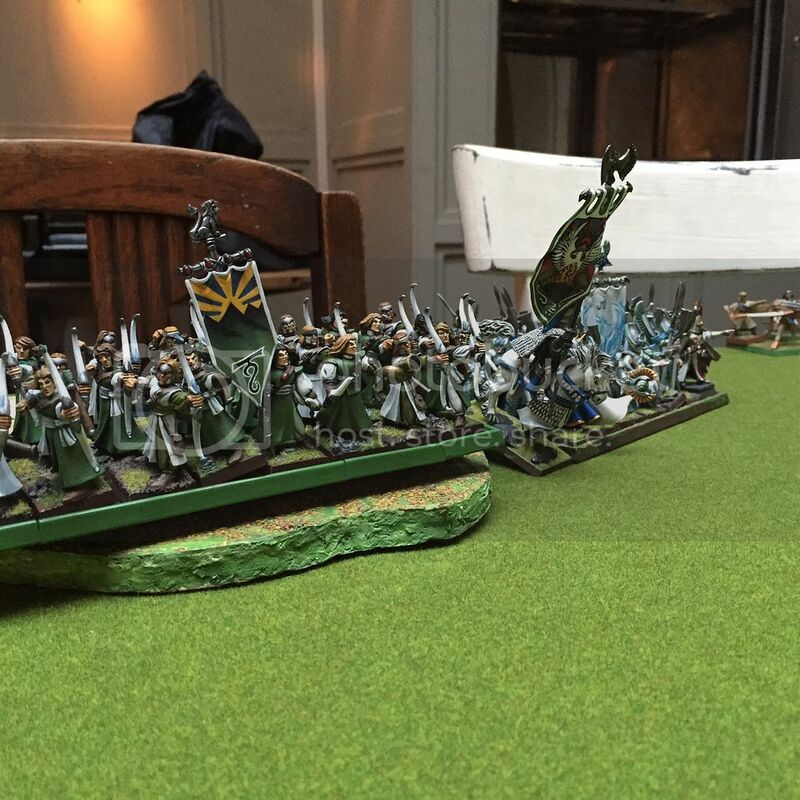 The seahelm sits with the infantry and ranged units to give them +1 to Wound, as do the loremasters, who cast Hand of Glory on bolt throwers in the early turns, before dedicating their efforts to combat units once battle is joined. The knights, relatively well armoured and hard to shift given that battleshock tests are determined by models lost, not wounds suffered, act as a forward screen when they’re not engaged in anti-machine duty – their speed allows them to keep particular units at a distance much better than the (harder) heavy infantry can manage. The prince and his re-rolls stiffening their spine long enough to join combat himself, or for the phoenix guard to come in, all the while your ranged attacks making their contribution. Judicious use of charge angles, to minimise attacks back, is important for combo-charges (a big deal in the new game, given that you and your opponent alternate attacks in each turn), as is manipulating the reach of your (and your enemy’s) combat weapons. These are the principles of the list – next we’ll look at the details. The battery on this laptop is dying, so that is upcoming. I’ll deal with army and unit formations after my next game, which I can use to take demonstrative pictures (thankfully the game is much simpler rules-wise, so easier to report). So, first, I’ll take a look at how you can use and abuse weapon reach in the context of the new combat rules, further to a recent email chat with my old colleague Dom Pemberton. No doubt I need to spellcheck the hell out of this thing, but the battery icon is flashing so, for now, adios amigos! This list looks good. 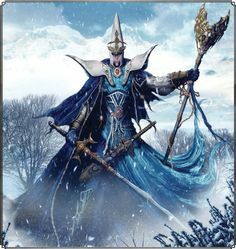 The Sea Helm and the Loremaster are great force multipliers for the High Elves, I've been including them in my lists as well for the exact same purposes. Quick question; given the overall speed of your army, do you see purposeful retreats being a big part of your strategy? If so, how do you envision that working? Thanks. Absolutely this is one way I envisage using these units, in particular the helms and reavers. It’s worth making a brief note of my first game in this context. It was against ogres, fielding a formation of stonehorn (charges hard, takes half damage), thundertusk (now complete with Bond villain freeze ray of death), two units of 3 mournfang and one block of 9 ogre bulls (my opponent choosing to deploy these together so as to get the first turn). I had the list above. This was my first game of AoS so I wasn’t quite sure what to expect from the enemy units, but it was clear from the off that the way the game treats movement has changed completely: no adverse leadership effects for retreating, and no pursuit moves or overruns for your opponent in the event of a retreat. My opponent deployed (from my point of view), mournfang, stonehorn, thundertusk, mournfang, bulls. I deployed reavers, phoenix guard with archers behind and, behind them, the bolters and infantry characters, then 5 dragon princes with prince behind, 5 dragon princes, 5 helms. Since my infantry centre with have its hands full in the centre, it was clear that I was out-matched on the left flank. So, after my opponent advanced full throttle with everything he had, I moved the reavers out forward and further to the left (how fantastic their extra 2d6 movement is), and drew some attention from the left-hand mournfang by firing 15 arrows into them. The thing was that, if my opponent wished to charge the reavers, he’d have to move away from the rest of my army. Since their shots would have quickly become a threat to his capital monsters, he did so, and only killed 3 of the 5 (5 reavers now have 10 wounds, have a more reliable 5+ save and are better able to pass leadership tests now that the psychological impact of wounds suffered has been replaced by casualties lost – they are, therefore, a much tougher nut to crack than before). As it happened in this game, I chose to stick with the combat on my turn so as to put more shots and attacks into the mournfang unit since, elsewhere, the battle was going fine. But, if my primary aim here was to draw this mournfang unit further away from the fight, now would have been the moment to retreat towards the board edge and force my opponent to follow if he wanted the unit dead (and 6 shots per turn are nothing to sniff at). Now that units can’t march, pursue or overrun, (running is much less reliable than automatic double movement, even though base movement is higher), assuming opponents don’t keep getting lucky with double-turns, it’s much harder for units stranded out of the fight to get back in good time. This combined rules-change to reliable retreats and slower average movement makes decoy retreats a good strategy. But knights can play defensive roles in another way – by acting as forward road-blocks. In this game I was concerned not to allow the other mournfang and the two monsters to charge into my phoenix guard all at once. This was made harder by the fact that my opponent got a double turn and immediately made it in with the stonehorn. Other units failed their charges but, with my fast knights, deployed slightly forward, I was able to quickly close that gap and charge in on the right flank – charges which I’d have likely failed with infantry, giving my opponent another chance at combining against my centre (the security of which rested entirely on the phoenix guard). Simultaneously, I prevented my opponent from supporting his stonehorn quickly enough, which was duly ground out by the guard with assistance from the loremasters’ arcane bolts, and some shooting, whilst most of my shooting brought down the thundertusk in a single round (40 shots from the archers, using re-rolls from the prince and +1 to wound from the seahelm, plus a bolt thrower – ouch). The dragon princes and prince in the centre attacked the 3 mournfang there (DPs front, prince flank) and, on the right, the 5 DPs and 5 helms together were robust enough to hold the bulls for as long as I needed to clear up elsewhere and move in for the kill. So, in this instance, charging with my knight units was as much about preventing a focussed multi-charge from my opponent on the most valuable part of my army as it was going on the attack myself. Both by charging and retreating, therefore, small cavalry units have very useful defensive applications. Thanks for the reply. Reavers are definitely one of the most versatile units now with their shooting and extra move. I want to use them exactly as you described, but unfortunately I've been playing Azyr Comp and they are prohibitively expensive in all but the largest games (unless brought in significant numbers). I hadn't considered Silver Helms for that role before though, so that is something I will give a try. anyone know if this chap plays anymore..
No idea sadly. He looked into AoS didn’t he, guess he might be on 9th Age? What are you playing these days Sparky? playing 9th these days and started some a song of ice and fire, which is actually very good! What’s going on with 9th generally? Is it more popular in some countries than others? started some a song of ice and fire, which is actually very good! Friend of mine’s a fan. Painting my Orcs very slowly. Sad that both he and I left around the same time in 2015. Hard to believe it's been almost 4 years since playing a WH fantasy game. Hard to believe it's been almost 4 years since playing a WH fantasy game. What are they playing now in your area dude?